I wanted to extend my stay in Makati, so I decided to use my reward points from an online booking site to reserve a hotel. With the points that I saved, I was able to get one night at The Hotel at Green Sun, only adding a minimal cost that's worth P136. So right after checking out from Alcoves, I made my way to the lodging via MRT. Getting to the hotel was easy. 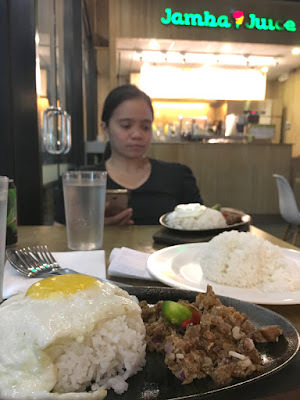 All it took was a quick transit from Ayala MRT to Magallanes station, and a casual 8-minute walk to the establishment, which was just along Chino Roces Ave. extension. You won't have a hard time finding the building, as it's situated on the left side of the road. To give you a brief background of the establishment, "the Hotel at Green Sun in Makati City, Philippines is among the few accommodations in the metro that boasts a fascinating piece of history bound to give you a stay like no other. Standing within what used to be Delta Motors Inc. from the 1970s, The Hotel at Green Sun innovates to maintain the industrial elements of the original car warehouse structure. Exposed pipes, bare concrete walls, and industrial beams and ceilings succinctly combine with Architect Gil Cosculluela’s modern-minimalist design, resulting to a masterpiece that is art in itself. But that is just the beginning. With amply appointed rooms and suites, and ultra-convenient facilities and services, your stay at the hotel means a seamless journey from our extensive history to the wonders of the contemporary. It is, after all, right at the heart of the place of wonder, entertainment, and inspiration that is Green Sun." The first entrance of Green Sun gives way to a function hall and SOMA Bistro. And as you walk further, you'll find the next entryway going to the hotel. Now, you might find the lobby with its empty spaces, given the lack in furnishings and styling. But what the reception area lacked in design, the hotel made up for in their rooms and suites. What got me so hooked with Green Sun Hotel was its modern chic and industrial inspired rooms. All of their personal spaces may have been windowless. But the design and the fixtures in the area made up for what it lacked in windows. My booked twin-bed room was tastefully designed. My twin-bed room was at the 2nd floor, and was accessed via an electronic keycard. It was pre-cooled, so it felt like I was entering a life-size freezer. I had to close the A/C, and turn on the exhaust fan from the bathroom, to absorb the cool air. That was probably the only disadvantage to having a window-less room. But everything else was great. Despite the A/C concern, I definitely loved the interiors of the room, especially the design and choice of colors. Everything looked so organic, yet very contemporary. The bed was comfy, the blanket kept me warm all throughout the night, and the pillows were soft. Even the carpet was clean. And the bathroom, however small its configuration, was spacious enough to bathe in (ample hot water, good lighting, lots of mirrors). 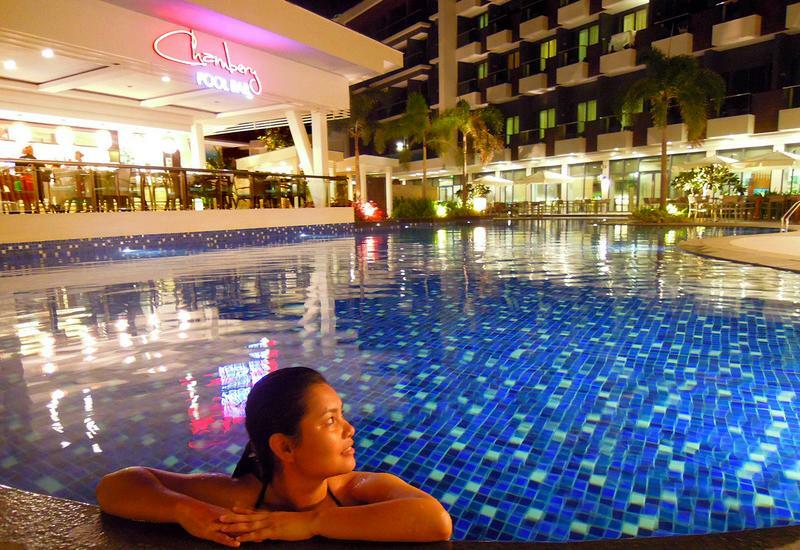 Now, true to being home to the arts, each hotel room also features a unique artwork by Maxeene Remulla, a rising Filipina digital media artist. It was like sleeping in an art gallery, but with a more relaxed ambiance. My friend and I ordered some warm drinks and a slice of red velvet cake before calling it a night. We actually enjoyed hanging out at the bistro because it had a chill vibe. It was also pleasing to look at given how artsy the interiors were. The next day, however, was a different story. 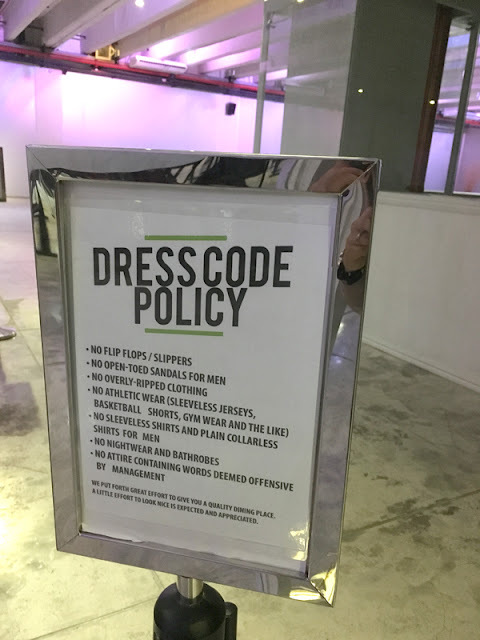 SOMA posted some really off guidelines about the appropriate attire that their guests should wear before entering the restaurant. I didn't get the expected welcome upon entering the bistro, and was almost denied entry because I was wearing "slippers". I had to explain to the waitress that I was wearing sandals. So upon checking my footwear, and seeing that mine had backstraps, the lady eventually let me in. 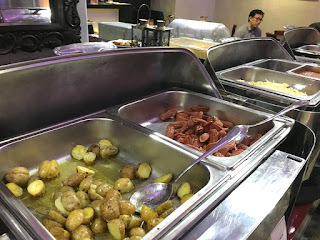 I didn't want the incident to ruin my morning, so I immediately made my way to the buffet spread, to at least enjoy the complimentary breakfast. While I was eating my chosen dishes, I asked one of the waitresses regarding SOMA's rules. She said that previous guests have already complained about it. And those who were denied entry because of their attire were still given the option to have their food taken to the room. This arrangement was still a big inconvenience, especially if the guests have already made an effort to go to the restaurant. The hotel wasn't even a four or five star hotel to begin with. I mean, I've stayed in a few ones, yet I wasn't denied entry based on what I wore to breakfast. I should be allowed to eat in whichever attire I choose to because I am, in fact a paid hotel guest. Of course, I didn't get mad with the wait staff, as they weren't the ones responsible for the rules. Now, the breakfast food at SOMA was nothing to rave about. 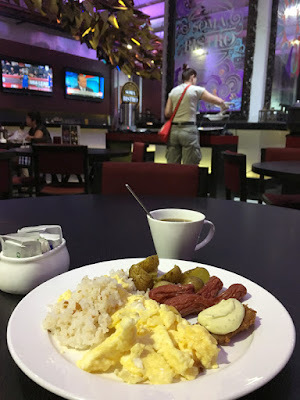 It had some of the usual staples like egg, garlic rice and hotdogs. 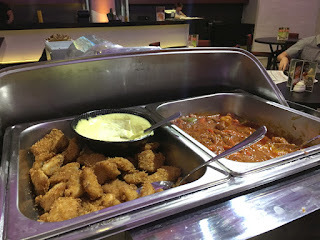 But was weirdly mixed into the buffet spread was the addition of red sauce spaghetti and caldereta (or was it Mechado?!). 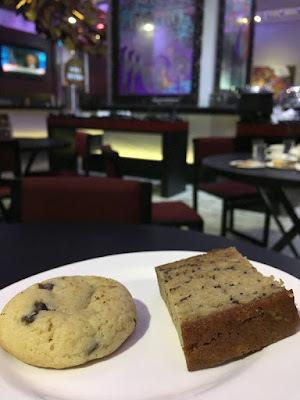 But aside from these offerings, I tried SOMA's cookies and banana bread, and was left unimpressed (5 out of 10). I've tasted better pastries that are more moist and tastier, thus the low rating. If you'd like to eat elsewhere, then there are several food options that are not too far from the hotel. There are a few fastfood joints at the Southgate Mall (Tapa King, Goldilock's, Jollibee), and a few more just right across Green Sun (a bar and Starbuck's). You can also go for a short stroll, and look for Eco Plaza, where you'll find a bunch of eateries all tucked into a fancy looking canteen. My friend and I actually got to order our dinner and drinks at Dencio's for just under P150 each. You'll also find in the establishment Yellowcab, Jamba Juice, Krispy Kreme and a lot more. My stay in the hotel would've been perfect if it had not for that incident at SOMA. So if you're thinking of staying there, make sure to comply, or have the unfortunate time of arguing with the staff.